The venture of IlluminatedBoatSign.com with No-Refresh brought satisfactory results by successfully providing incredible online lettering design tool to their customers. Using this letter design application software, their users can create vinyl boat lettering, boat registration numbers, etc. The custom lettering design program certainly enables the end users to create designs without any trouble. It is a custom tool integrated with resize and drag option and comes with simple point-and-click option. They can add different text and fonts at the same time furnishing marvelous effects in it. "Our decision to opt No-Refresh really rendered immense success to our business. Every dream regarding the business growth has been materialized by its professional team of developers and designers. Great delivery and matchless affordability recite the entire story!" Illuminated Boat Signs is a group of Luxury Yacht owners and Business people, who developed this company through research and experience. IBS offers simple and free to use graphic design tools to design own Luxury Yacht. At Illuminatedboatsigns.com, a person can create highly personalized illuminated custom vinyl boat lettering in minutes with great ease by simply using online lettering design software. Illuminated Boat Signs had an urgent requirement of easy-to-use online Lettering Design tool to provide its website users the facility of custom vinyl boat lettering, boat registration numbers, personal watercraft and custom boat gear online. Illuminatedboatsigns.com appealed No-Refresh to develop an interactive and feature-rich custom lettering design application software for vinyl boat lettering. No-Refresh has given IlluminatedBoatSigns.com an interactive means to reach customers more effectively and engaging them in creating personalized vinyl boat lettering that provides them a wonderful experience. The custom letter design application software gave Illuminated Boat Signs visibility into fiercely competitive marketplace. The robust online lettering design application software developed by No-Refresh is perfect for creating custom, self-adhesive, waterproof, and ready to apply vinyl boat lettering, boat registration numbers, personal watercraft and custom boat gear quickly. The tool comes with drag and resize with easy point-and-click option, add texts option, different font styles for text, and many other fabulous text effects! An end user can create custom vinyl boat lettering design online in minutes with great ease by using online lettering design application. With the help of this tool, user can customize the lettering by choosing one of many luxury yachts and see how boat name looks in minutes! Simply enter available sign measurements to get started with the process of designing custom vinyl boat lettering. Type boat name and now customize the text by changing the font type, bold type, and font size, colour of vinyl, stainless steel finish and outer glow. 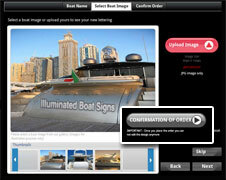 This interactive tool allows an end user to upload boat image. One can choose image from gallery of existing boat designs. A person can even upload image from personal computer also. Adjust the new lettering design by dragging and dropping it on right position on the boat image. Customize the lettering design by resizing and tilting the text by using the powerful lettering design application which allow user to do all these things easily. Simply place an order for the highly personalized vinyl boat lettering design.